-For best results, install directly into a wall stud. -Use a stud finder to locate a wall stud. -Use a power drill to drive the included screws through the wood base, and directly into wall stud. -Twist guitar hanger into wood base until snug. -If you are unable to find a wall stud, you need to first install the plastic anchors. KEEPS YOUR GUITAR SECURE- Unique rotating tabs lock into place when you set your guitar on the hanger. Simply lift up the guitar and the tabs rotate out of the way again. 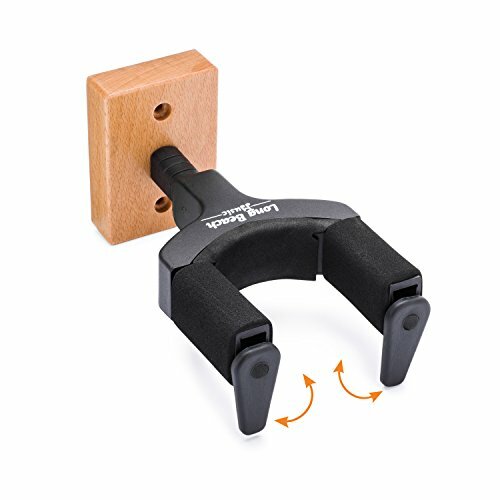 DURABLE- Solid wood base and metal bracket wrapped in ABS plastic is strong enough for any size guitar- acoustic, electric, bass, etc. Foam-padded bracket won't leave any marks on your instrument. EASY TO MOUNT- We recommend installing directly into a wall stud using the included drywall screws. 100% SATISFACTION GUARANTEED- We custom design and manufacture these guitar hangers using quality materials. If you are not fully satisfied, we will give you a full refund.